JTV-519 (K201) is a 1,4-benzothiazepine derivative that interacts with many cellular targets. It has many structural similarities to diltiazem, a Ca2+ channel blocker used for treatment of hypertension, angina pectoris and some types of arrhythmias. JTV-519 acts in the sarcoplasmic reticulum (SR) of cardiac myocytes by binding to and stabilizing the ryanodine receptor (RyR2) in its closed state.It can be used in the treatment of cardiac arrhythmias, heart failure, catecholaminergic polymorphic ventricular tachycardia (CPVT) and store overload-induced Ca2+ release (SOICR). Currently, this drug has only been tested on animals and its side effects are still unknown. As research continues, some studies have also found a dose-dependent response; where there is no improvement seen in failing hearts at 0.3 μM and a decline in response at 1 μM. K-201 (JTV-519; 1,4-benzothiazepine derivative) is an antiarrhythmic drug, had been in phase II clinical development at Japan Tobacco and Sequel Pharmaceuticals for the intravenous treatment of atrial fibrillation; however no recent developments have been reported and Sequel Pharmaceuticals has ceased operations. In 2006, NovaCardia acquired rights from Aetas to develop the product in Europe and US for cardiovascular disorders. Sequel acquired the compound, which has a unique multi-ion channel profile, from NovaCardia following its acquisition by Merck & Co. Treatment with JTV-519 involves stabilization of RyR2 in its closed state, decreasing its open probability during diastole and inhibiting a Ca2+ leak into the cell’s cytosol. By decreasing the intracellular Ca2+ leak, it is able to prevent Ca2+ sparks or increases in the resting membrane potential, which can lead to spontaneous depolarization (cardiac arrhythmias), and eventually heart failure, due to the unsynchronized contraction of the atrial and ventricular compartments of the heart. When Ca2+ sparks occur from the SR, the increase in intracellular Ca2+ contributes to the rising membrane potential which leads to the irregular heart beat associated to cardiac arrhythmias. It can also prevent SOICR in the same manner; preventing opening of the channel due to the increase of Ca2+ inside the SR levels beyond its threshold. In the closed state, N-terminal and central domains come into close contact interacting to cause a “zipping” of domains. This leads to conformational constraints that stabilize the channel and maintain the closed state. Most RyR2 mutations are clustered into three regions of the channel, all affecting the same domains that interact to stabilize the channel. Any of these mutations can lead to “unzipping” of the domains and a decrease in the energy barrier required for opening the channel (increasing its open probability).This channel “unzipping” allows for an increase in protein kinase A phosphorylation and calstabin2 dissociation. Phosphorylation of RyR2 increases the channel’s response to Ca2+, which usually binds the RyR2 to open it. If the channel become phosphorylated, this can lead to an increase in Ca2+ sparks due to an increase in Ca2+ sensitivity. Some researchers believe that the depletion of calstabin2 from the RyR2 causes the calcium leak. The depletion of calstabin2 can occur in both heart failure and CPVT.Calstabin2 is a protein that stabilizes RyR2 in its closed state, preventing Ca2+ leakage during diastole. When calstabin2 is lost, the interdomain interactions of RyR2 become loose, allowing the Ca2+ leak. However, the role of calstabin2 has been controversial, as some studies have found it necessary for the effect of JTV-519, whereas others have found the drug functions without the stabilizing protein. JTV-519 seems to restore the stable conformation of RyR2 during the closed state. It is still controversial whether or not calstabin2 is necessary for this process, however, many studies believe that JTV-519 can act directly on the channel and by binding, prevents conformational changes. This stabilization of the channel decreases its open probability resulting in fewer leaks of Ca2+ into the cytosol and fewer Ca2+ sparks to occur. Researchers who believe that calstabin2 is necessary for JTV-519 effect, found that this drug may function by inducing the binding of calstabin2 back to the channel or increasing calstabin2’s affinity for the RyR2 and thus increasing its stability. Original Assignee Marks Andrew R., Landry Donald W., Deng Shi X., Cheng Zhen Z. 2,3,4,5-tetrahydrobenzo[f][1,4]thiazepines are important compounds because of their biological activities, as disclosed, for example, in U.S. Pat. Nos. 5,416,066 and 5,580,866 and published US Patent Applications Nos. 2005/0215540, 2007/0049572 and 2007/0173482. Synthetic procedures exist for the preparation of 2-oxo-, 3-oxo-, 5-oxo- and 3,5-dioxo-1,4-benzothiazepines and for 2,3-dihydro-1,4-benzothiazepines. However, relatively few publications describe the preparation of 2,3,4,5-tetrahydrobenzo-1,4-thiazepines that contain no carbonyl groups, and most of these involve reduction of a carbonyl group or an imine. Many of the routes described in the literature proceed from an ortho-substituted arene and use the ortho substituents as “anchors” for the attachment of the seven-membered ring. Essentially all the preparatively useful syntheses in the literature that do not begin with an ortho-substituted arene employ a modification of the Bischler-Napieralski reaction in which the carbon of the acyl group on the γ-amide becomes the carbon adjacent the bridgehead and the acyl substituent becomes the 5-substituent. Like earlier mentioned syntheses, the Bischler-Napieralski synthesis requires reduction of an iminium intermediate. It would be useful to have an intramolecular reaction for the direct construction of 2,3,4,5-tetrahydrobenzo[1,4]thiazepines that would allow more flexibility in the 4- and 5-substituents and that would avoid a separate reduction step. The Pictet Spengler reaction, in which a β-arylethylamine such as tryptamine undergoes 6-membered ring closure after condensation (cyclization) with an aldehyde, has been widely used in the synthesis of 6-membered ring systems over the past century and might be contemplated for this purpose. The Pictet Spengler reaction, however, has not been generally useful for 7-membered ring systems such as 1,4-benzothiazepines. A plausible explanation is that the failure of the reaction for typical arenes was due to the unfavorable conformation of the 7-membered ring. There are two isolated examples of an intramolecular Pictet-Spengler-type reaction producing a good yield of a benzothiazepine from the addition of formaldehyde. In one case, the starting material was a highly unusual activated arene (a catechol derivative) [Manini et al. J. Org. Chem. (2000), 65, 4269-4273]. In the other case, the starting material is a bis(benzotriazolylmethyl)amine that cyclizes to a mono(benzotriazolyl)benzothiazole [Katritzky et al. J. Chem. Soc. Pl (2002), 592-598]. We report an efficient and scalable synthesis of 7-methoxy-2,3,4,5-tetrahydrobenzo[1,4]thiazepine, the core structure of biologically active molecules like JTV-519 and S107. 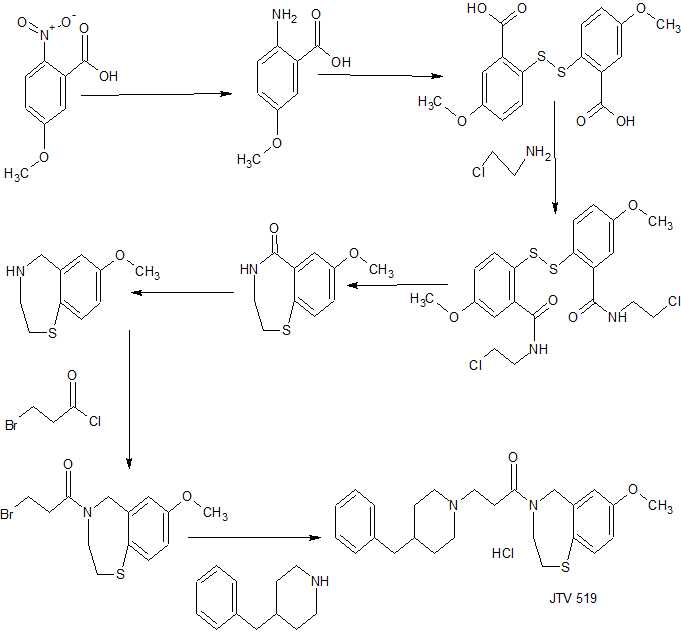 This synthetic route, starting with 4-methoxythiophenol and proceeding via acyliminum cyclization, gives the target product in four steps and 68% overall yield and is a substantial improvement over previously published processes. 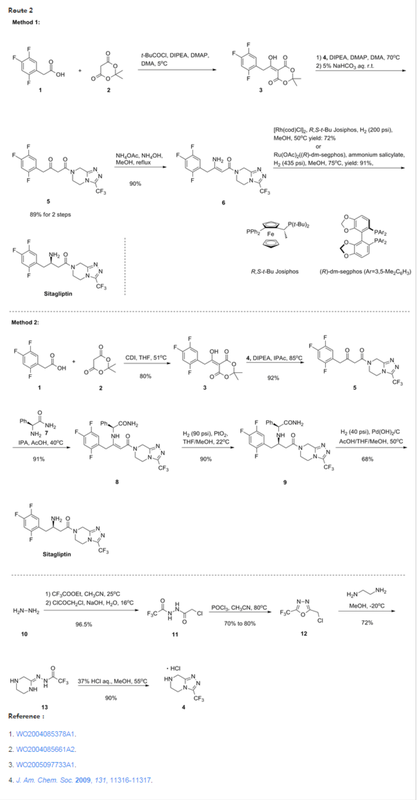 Nine additional examples of tetrahydrobenzo[1,4]thiazepine synthesis via acyliminium ring closure are also presented. ^ Jump up to:a b c d e f Oda, T; Yano, M; Yamamoto, T; Tokuhisa, T; Okuda, S; Doi, M; Ohkusa, T; Ikeda, Y; et al. (2005). “Defective regulation of interdomain interactions within the ryanodine receptor plays a key role in the pathogenesis of heart failure”. Circulation. 111 (25): 3400–10. PMID 15967847. doi:10.1161/CIRCULATIONAHA.104.507921. ^ Jump up to:a b c d e f g Hunt, DJ; Jones, PP; Wang, R; Chen, W; Bolstad, J; Chen, K; Shimoni, Y; Chen, SR (2007). “K201 (JTV519) suppresses spontaneous Ca2+ release and 3Hryanodine binding to RyR2 irrespective of FKBP12.6 association”. The Biochemical Journal. 404 (3): 431–8. PMC 1896290  . 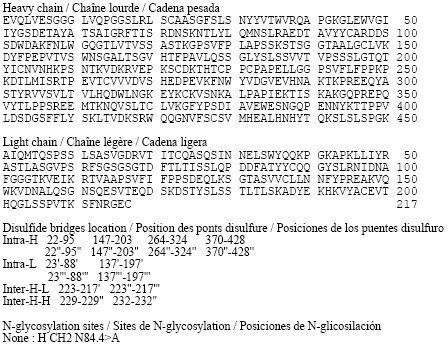 PMID 17313373. doi:10.1042/BJ20070135. ^ Jump up to:a b c d e f g h i j k Wehrens, XH; Lehnart, SE; Reiken, SR; Deng, SX; Vest, JA; Cervantes, D; Coromilas, J; Landry, DW; Marks, AR (2004). “Protection from cardiac arrhythmia through ryanodine receptor-stabilizing protein calstabin2”. Science. 304 (5668): 292–6. PMID 15073377. doi:10.1126/science.1094301. ^ Jump up to:a b c d e f g Toischer, K; Lehnart, SE; Tenderich, G; Milting, H; Körfer, R; Schmitto, JD; Schöndube, FA; Kaneko, N; et al. (2010). “K201 improves aspects of the contractile performance of human failing myocardium via reduction in Ca2+ leak from the sarcoplasmic reticulum”. Basic research in cardiology. 105 (2): 279–87. PMC 2807967  . PMID 19718543. doi:10.1007/s00395-009-0057-8. Jump up^ Viswanathan, MN; Page, RL (2009). “Pharmacological therapy for atrial fibrillation: Current options and new agents”. Expert Opinion on Investigational Drugs. 18 (4): 417–31. PMID 19278302. doi:10.1517/13543780902773410. By DR ANTHONY MELVIN CRASTO Ph.D in Uncategorized on October 12, 2017 .